GM Performance :: View topic - 04 2500HD 6.0 Tow rig Maggie or Whipple? GM Performance Forum Index » GM Performance Forum » 04 2500HD 6.0 Tow rig Maggie or Whipple? 04 2500HD 6.0 Tow rig Maggie or Whipple? So its been forever since i've been here what can I say life happened and I got real busy. anyway straight to the point. I have a 04 2500HD 6.0 that I want more derivable towing power from, I tow 200+ miles every weekend from April to November. I was going to go the diesel route but my budget didn't allow me to pay 15k more for the exact same truck I have now just with a duramax at the time, so now its time to mod it. I have been looking at the maggie and whipple kits, just stoppling by to get some opinions here, I know many of you have had whipples and some have had maggies. What would be your best choice? I am leaning on a whipple just from what I have been a part of here in the past, but have had a few people say go with a maggie because they are oem reliable. Price is similar and I know both kits are probably great, I want a complete bolt on kit and I don't have time to play around with tuning or anything else. I want to bolt it on and drive it and have it very reliable. I didn't create an actual vote because TBI™ is not an option! This lets a lot of hot pressurised air blow by, between the lobe and the casing. Whipple has high twist rotors which puts 2 lobes between the high pressure and atmos pressure, reducing blow-by and incresing efficiency. I beleive the new TVS high twist 4 lobe 160* does that also and should be similar to whipple in efficiency. The whole "internal compression" claim of Whipple is bullcrap. If it was the case, it would not spin freely which it does when the by pass is open. And I have one and it does spin freely by hand. Whipple having an asymetric desing means that one rotor rotates faster than the other. The energy put into that extra rotation increases to the square of the RPM. which is useless waisted energy. But the way the way Whipples rotors mesh might give it a sealing advantage. But also a reliability concern because the timing between the lobes is more critical than the maggie. I like Whipple but I think the new 4 lobe high twist Maggie has matched it in performance and if oem choses TVS over Whipple, they obviously know something. I like this kind of information, I was looking at the TVS from maggie and your right about OEM choosing them. it must mean reliability and quality of some sort. 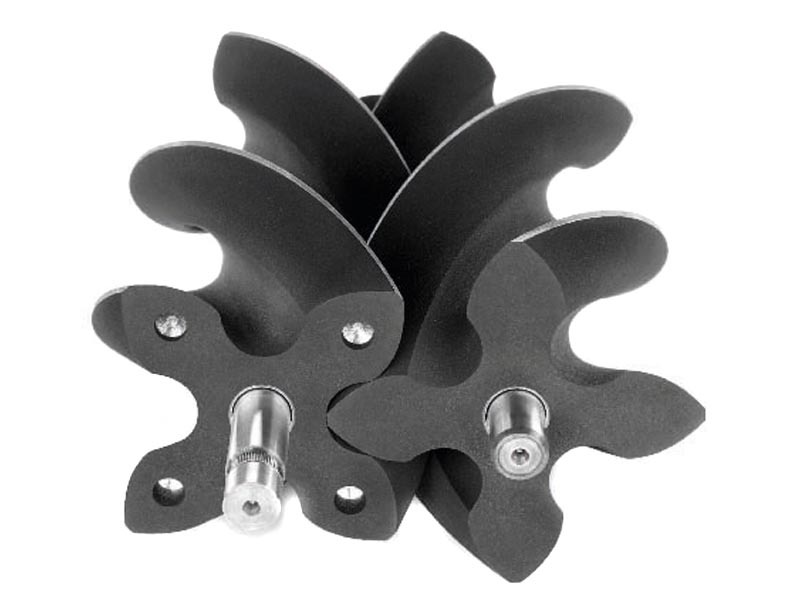 I've found a lot of scuff up Whipple rotor pictures online, bought one myself from a marine application. I think the asymmetric design causes interference when the rotors heat up. Because of differences in expansion behavior. Might not be an issue in a dd. Could be in hi power output for long duration like towing. I think a symmetrical design like TVS would have an advantage on that but i did find a coating pealing issues for the tvs. It would be nice to find a direct comparison test between the two. And of course, price is important. Both kits that I am looking at are within $200 in price so I guess its just down to whats better for daily driving and towing. About the internal compression claim of the whipple screw compressors, for that to happen, the air space between the lobes needs to diminish as the air travels toward the outlet. This does not happen with the Whipple because the rotors are too short. 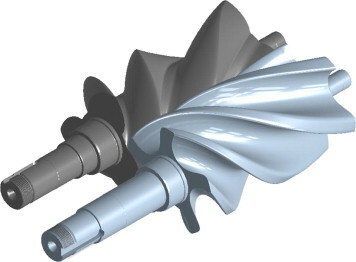 As soon as the rotors closes the inlet to the air trapped between the lobes, the outlet opens up and the trapped air is pushed out into the intake. Not enough rotation to reduce the size of the air pocket. And also, we can clearly see that the lobes are consistent in shape and size on the entire length of the rotors. So there's no compression due to geometry change. Otherwise the supercharger would be compressing air even when not needed and that would not be fuel efficient. I hate when a company misleads it's customers for marketing purpose on something that is complex and not obvious to the laymen. So the new generation TVS might be a ROOTS and Whipple a SCREW, functionally, they are very close. I think it comes down to ease of installation, reliability and customer service. After doing even more research, being the maggie uses eaton rotor packs and eaton is used on OEM vehicles its making more sense now. look how much cash OEM's have to spend on testing, way more than any aftermarket has and your right if the OEM's are using eaton then it just makes sense. I have also been doing research about the rotor packs and the twin screw does have a faster spinning rotor that can run in to bearing issues as the slower rotor is driven by the belt and the faster rotor is driven faster than the belt driven rotor. So there is a difference between roots and twin screw and the TVS seems to be the better design i guess. This below video helped a lot. Oh and this is what a real internaly compressing screw looks like. And I'm not saying that Wipple is a bad design. Not at all. 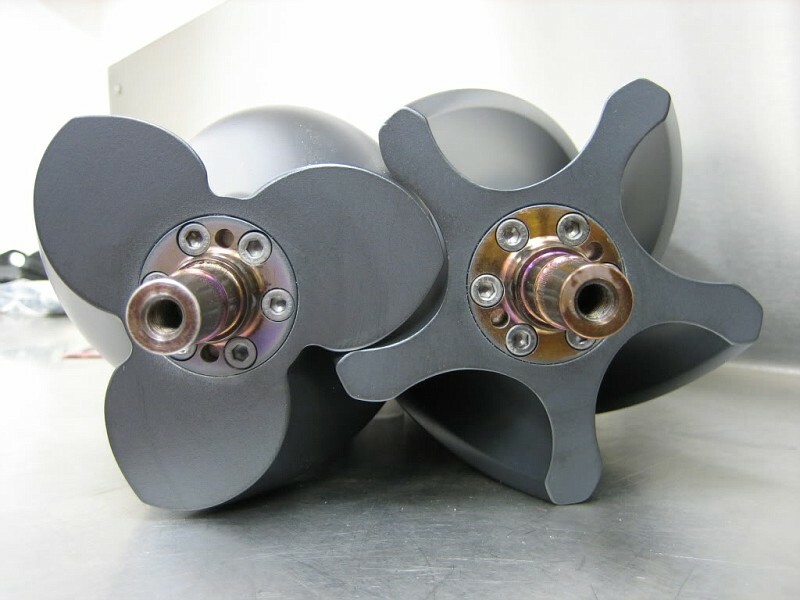 twin-screws have been used in indutrial compressors for ions. Lysholm brought this technology to cars and it definately works. But is it the best design? Eton Corporation improved their design and produces the TVS for companies such as: ROUSH Performance, Edelbrock, Street Legal Performance, Magnuson, and VMP Tuning. They have taken the TVS supercharger and modified it to allow for it to work with many different types of vehicles. On the flip side, looks like Lysholm produces SCs for Whipple who heavily markets them on social media. This is a good comparison TVS2.3 vs Whipple 2.3. And is basically the LSA's rotors setup. Base on these maps alone, the TVS is a clear winner. All engines have 6.2 liters of 376 cubic inches of displacement. Eton is huge and they probably design and tested their superchargers in collaboration with Ford and Gm' R&D deps. Pretty hard for Whipple (Lysholm) to compete . 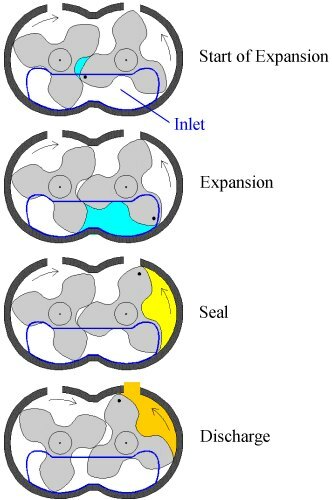 If you look at the cross section of the 3 lobe rotor it's massive! And it's the one that rotates faster. 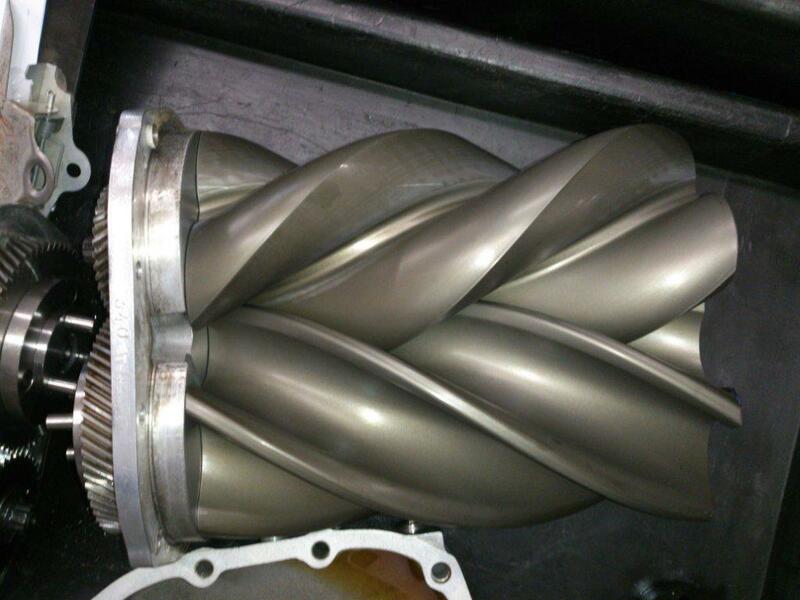 1.67 times faster than the input shaft. I'm sure it takes quite a bit of energy to accelerate to 15000+ rpm ( loss of acceleration power) and when the transmission shifts, all that rotationnal enertia will stresses the snout and belt system. Whipple did do the 2005 Ford GT and its 550hp 5.4, mid engine rear drive. Supercharged Ford Lightning Trucks, Harley Davidson Trucks and Ford Mustang Cobra SVT are equipped with an OEM factory Eaton M112 Gen4 blower. I remember back when Autorotor supplied Whipple with screwchargers, then Whipple split from Autorotor.. There were able to snag the Ford GT contract, but there was issue with their production capability at the time. Whipple is used on the Chrysler, Ford and GM drag packages like COPO in a few flavours, one being a 4.0 liter screwcharger. Whipple is huge in marine circles, Mercedes is into the screws as well. True but I was referring to relatively mass produced cars. If Whipple was the best, they would have gotten everything after the Ford GT. Probably not as fuel efficient as the TVS and/or more expensive to produce. I do believe they are ideal for marine where the boost is high and the RPM is high and constant. So the GT+Whipple needed 2 extra psi for the similar output per liter. I'm not saying that Whipple is best, just illustrating that OEMs have and do use screwchargers, but the Roots esp. the TVS Eaton is used MUCH more.. The large mass of the screwcharger rotors would be stressful on the drive units, esp during WOT upshifts. IIRC James B busted the snout off of his HT/ZZ383 shortblock and it used a forged steel crank. That's a lot of mass and that's coupled with the one rotors spinning significantly faster than the other. The newer TVS's, esp. the GEN 6 units are up in territory once only enjoyed by turbos. I forgot about Kenne Belle as well, they originally used Autorotor compressors when they did the Ford Lightning 99-04 5.4 liter trucks. In 2005 they introduced their own 2.1, 2.6, 2.8, 3.6 and 4.2L superchargers. Looks like they do a 4.7 and 4.9 size nowdays. I remember there was a Magnacharger kit specifically for the 5.7 Vortecs (L31) IIRC they had some sort of powertrain warranty on them. They were also emissions legal. They also made a complete intake Roots blower that replaced the intake manifold. It could have been made to work, but way back when it cost a fortune. Whipple makes an 8.3 liter Whipple (W510R) that is designed to replace 6-71 through 14-71 blowers on BBCs. I need to stop shopping, or win the lottery.